CONSISTENCY – this is the philosophy in the policy of MILKANA Ltd. - Pleven. Consistent investment, persistence in the selection of experts, consistence with competitive prices and high quality of the production. With this philosophy we started in 2003 in a small workshop for production of glazing. 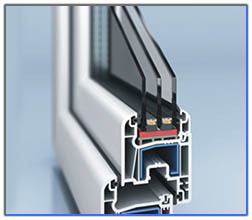 We opened stores for trading with profiles and accessories for the manufacture of PVC and aluminum windows. We expanded our business and we launched new products - high quality laminated flooring, parquets and furniture hardware. We also developed in glass processing by investing in equipment and machines. The time was passing and we gained more and more knowledge and experience. Then we modernized the glazing production and founded workshops for making of frames. Today, all industries are certified and glazings were tested at an independent laboratory in Italy. We are proud that we are one of the few Bulgarian companies working on European standards and continue to seek and produce innovative products. Part of Milkana’s large family is the well developed distribution network which we built with hard work, loyalty, quality products, good service and cooperation. This is the way to build trust and we deserve it. 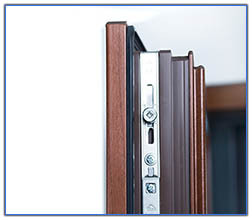 Since 2010, we have a strong position in the Italian market, which for we manufacture doors and windows. We established business contacts with Belgium, France, Germany and Switzerland. These markets allow only high quality products and competitive prices, and Milkana produces and sells only such products. The partnership with these countries taught us to invest in modern equipment, continuous training of professionals and then new markets come. This presentation of the entire range of production is a big investment and especially at a time of crisis. We believe that this is the right way to the customers - to let them touch, try out so as to be sure of the quality. Our customers needed to make their choice directly and we have provided it to them. With high quality and loyalty to the customers a name is built and that’s why we work this way. Today, thanks to his hard work and professionalism, we are a reliable partner for thousands of customers. This is because our philosophy is consistency - since the first steps till today..
MILKANA DESIGNER aluminum windows Series is for those who want to be different. The design we leave to you. You decide if you want straight and stylish shapes or prefer soft and rounded lines, whether you like modernism or you’re a fan of the classics. And the colors - think of a color and we will run it. 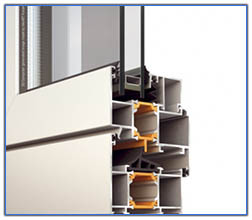 MILKANA ARCHITECT aluminum windows series is designed for those who really want the best. Extremely stylish look with classic design lines. Unlimited choice of RAL colors, colors with a special Collection Futura finish, wood decoration from MILKANA WOOD DESIGN collection and the possibility of combining colors inside and outside. The lack of visible hinges and the elegant accent, which SWING handle adds, make the MILKANA ARCHITECT window a real gem, giving extreme elegance and style to any interior. The special technology of angles’ joining provides a perfect finish with no visible joints. Real art in the windows. Due to the different options in the profiles’ geometry, a variety of styles design can be achieved - minimalist, modern, neo- classicism, traditionalism. 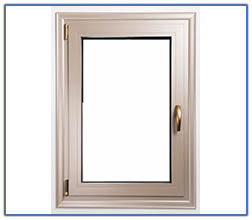 Perfect finish adds elegant trim that frames the window as a picture. The elegant SWING handle enhances the feeling for art and emphasizes the stylish look of the MILKANA ART window. The special technology of angles’ joining provides a perfect finish with no visible joints. Elegance in every detail. The MILKANA INNOVATION PVC windows are symbol of balance and aesthetics, style and timeless elegance. Possibility of making unilaterally foiled windows. For example, to preserve the appearance of the building, outside the window remains white and on the inside it is colored and vice versa. 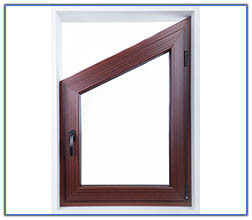 MILKANA EVOLUTION PVC windows series really are an achievement in the field of energy saving. 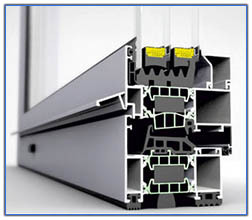 They are designed to be suitable for passive houses. The passive house has both in winter and in summer constant comfortable temperature without the use of conventional heating and air conditioning systems. The use of the available heat from sunlight through the windows, and the heat generated by appliances and residents is sufficient to keep the indoor temperatures pleasant during the heating season. Requirement for passive house is an annual heating costs no more than 15 kWh/m2. This is consistent with comparable fuel consumption of about 1.5 liters Comfort during the summer - days with temperatures >25°C - less than 10%. Excellent insulation helps improve energy efficiency. High level of comfort improves quality of life. 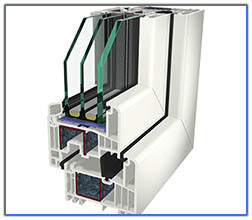 Your investment in the MILKANA EVOLUTION windows series will recover payback because of the potential for energy savings from the windows within a short period of time. MILKANA OPTIMUM PVC windows series is designed to meet lower budget without impacting the functionality and reliability of your windows. Our long experience in the windows business helped us to choose the right materials so as to create a product that is the optimal combination of price and performance. 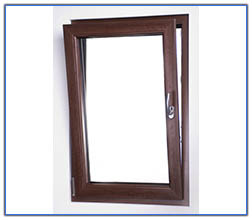 MILKANA OPTIMUM PVC windows Series is with soft, slightly rounded shapes, giving comfort and beauty to your home. The extremely smooth surface of the profiles makes them not only good looking but also very easy to clean and maintain. Just wipe with a damp cloth and your windows will shine. Choosing MILKANA OPTIMUM windows series you get windows that will not only serve you longer, but will look good regardless of the extreme weather conditions they are subjected to. Besides the traditional white color that blends with any interior and exterior, we offer four standard wood patterns - golden oak, dark oak, wenge and mahogany. The colors of Group C1 - four wood patterns and four RAL colors are in higher price category and require more time for delivery. Colors of group C2 have requirements for quantity in addition. 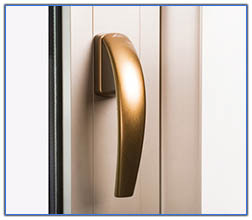 The stylish HOPPE Atlanta Secustic handle - in its various color options - matching the decorations hinges adds even more elegance to your windows. MILKANA DESIGNER DOOR aluminum front doors series give you the freedom to be creative and different. The variety of designs and colors make them a unique focus of any facade. All RAL colors are available as well as the colors with COLLECTION FUTURA special finish. 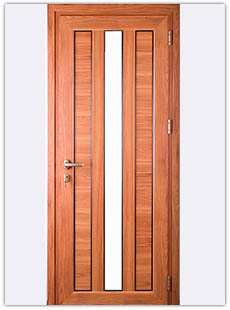 And MILKANA WOOD DECOR gives the MILKANA DESIGNER DOOR the warm patterns of real wood. 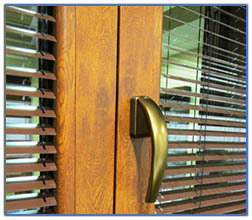 Yet, unlike real wood, our doors are maintenance-free, they are timeless. 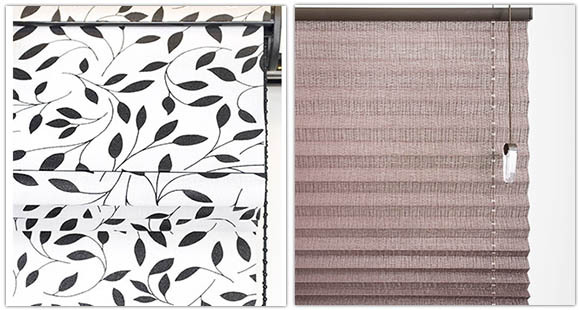 We offer a rich collection of decorative panels of BCD. The veneer has been produced by cutting or the so-called “development of pre-processed section of log”. It is a thin sheet of wood, which - through special technology - is adhered to the various boards: MDF, chipboard. It can be a radial or tangential, depending on the cutting direction. In the radial wood cutting the veneer is cut at a right angle with respect to the annual rings, creating the along fibers effect. In tangential veneer cutting, the cutting is made by the chord to the center. 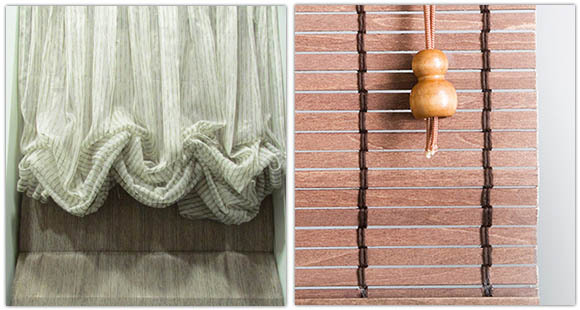 Doors covered with natural veneer are not only more beautiful, but also more sustainable. 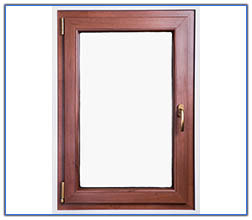 The produced by the standard laminated MDF doors are solid. 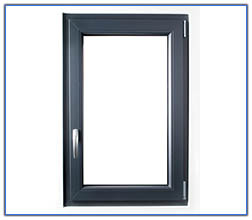 If the customer wishes each door can be glazed at 1/3, 2/3 and 3/3. 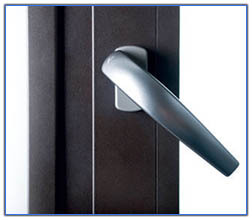 They can be additionally equipped with handles and cylinder inserts for the locks. Milkana interior glass doors are a symbol of style and timeless elegance. Made of 8 mm tempered glass and interior fittings DORMA, the Milkana glass doors are not only beautiful but also functional. 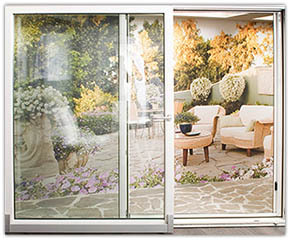 Give personality to your glass doors. 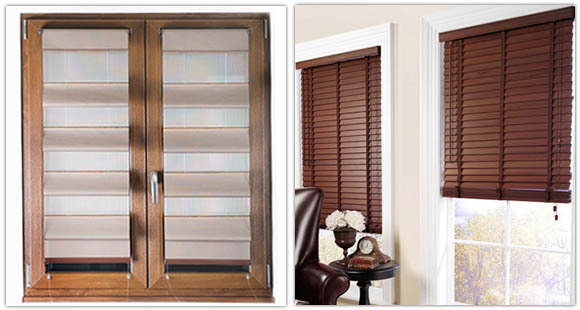 You can choose colored glass - brown, green or gray. You can choose frosted or clear. See our collection or pick design and we will produce it for you.. The multifunctional steel doors are used as in industry - factories and warehouses - so in public and administrative buildings. They can be made according to your individual needs. 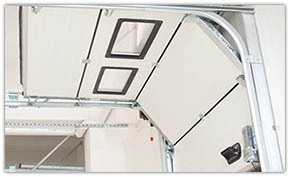 The steel fire-resistant, self-closing, smoke and gas tight, heat and noise insulating, and spark-proof doors are designed to prevent the spread of fire from premises or burning sector where a fire to adjacent rooms occured, as well as ensuring the safe evacuation of people through it. 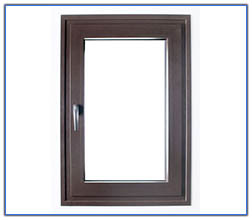 The doors are installed at sites where there are requirements for doors with higher fire resistance at fire impact on both sides of the door and constantly open doors that close themselves in case of fire. 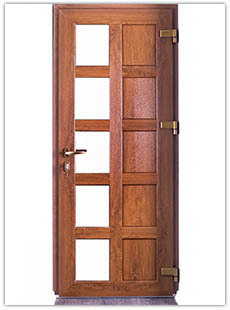 In case of fire, the door retains its integrity for 30', 60', 90' or 120 minutes, depending on the fire resistance class, which it was tested for and reduces the thermal radiation of fire from one compartment to another. The determination of the fire resistance of fire doors and closing devices purposed to be fitted into holes is carried out in European standard adopted as BDS EN 1634-1:2009. The door classification is done under BDS EN13501-2 with bilateral fire impact. The conformity assessment under Part Three of NSISOSSP is done by issuing an Opinion on the Eligibility pursuant to Article 54 of the Ordinance on the essential requirements for construction and conformity assessment of construction products in the Directorate General of Fire Safety and Protection of Population by MI Sofia. 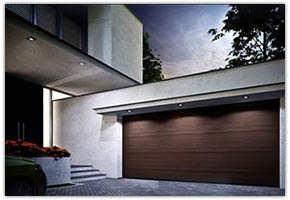 The comfort and safety during use, elegant design, the use of the latest technology in accordance with European safety standards, as well as the wide range of accessories, convert the MCA garage doors into ideal solution for your garage. The sectional industrial doors are the ideal solution for the closure of industrial space in specific design situations. The size is according to the customer and the use of special components allows various technical solutions for intensive use doors. 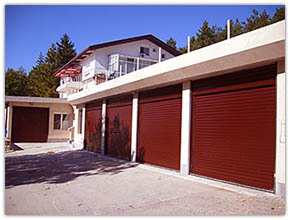 The roller garage doors of MILKANA are perfect for closing your garage. They are functional and aesthetically beautiful. And thanks to the ability to choose from all the RAL colors, as well as from 3 tree patterns - Golden Oak, Dark Oak, Mahogany - you can combine your garage door with the color of the windows or to give personality to the facade. 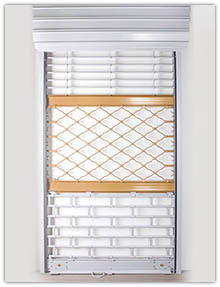 There is an option to embed small windows or ventilation grilles. 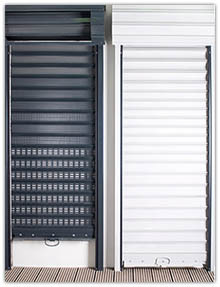 The primary function of safeguard rolling shutters is to restrict access to shops, public and residential buildings, etc. A combination of several types of plates can be made. Unlimited choice of RAL colors. MILKANA HOME sliding windows series are suitable for internal partitioning and for places where insulation is not required. They are a budget solution for spaces limited to another type of opening. They can be both of single glass and glazed. Unlimited colors and wood finishes from the MILKANA WOOD DECOR collection. MILKANA ART Series aluminum sliding windows for porches is inspired by the artistic imagination of contemporary architects. Whether for public buildings, restaurants and hotels or private home or villa, in their projects the architects increasingly rely on large windows. This is a challenge for us - the window manufacturers. This is the idea of the aluminum system for porches of MILKANA SPACE series. 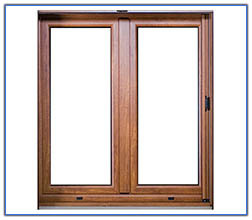 The ability with one movement to open an entire porch without leaving any glazing on your way is INCOMPARABLE. One movement - and indoor and outdoor space become one. It’s so easy - unlock, drag and all the wings stack at the one or both ends. Large windows to the garden or the porch have always been object of admiration. The bigger they are, the more spacious view they reveal. The room fills with natural light and the beauty of nature enters the house. Even when you are inside, you can be outside. PVC system for porches of MILKANA INOVATION series gives an opportunity to open large spaces by moving and parallel sliding of large wings. Although they are quite heavy, considering triple glazing, due to the special HAU TAU ATRIUM SP KOMFORT mechanism, the opening is easy, and with a slight movement of the wing it closes on its own. The only thing which remains for you to do is simply rotate the handle and make sure that your home is insulated and protected. 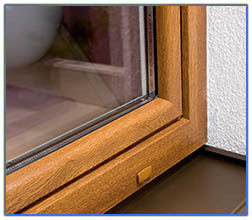 Thanks to the windows for porches of MILKANA INOVATION series you save space and gain views. Drag all the glazing to expand the living room. 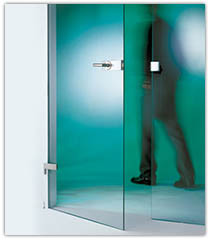 The system allows a wide opening - up to 4 meters - without the wings to enter the room and disturb you. No need to move objects each time you want to ventilate. 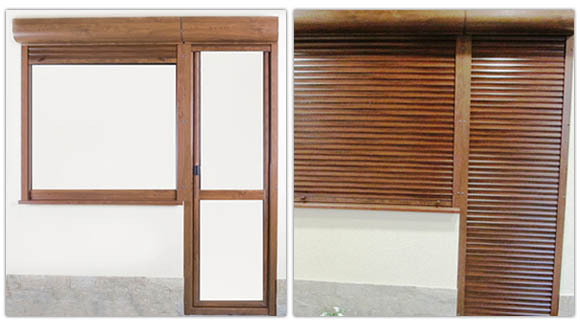 The external roller shutters of MILKANA FANCY series are the perfect addition to any window.. The external roller shutters of MILKANA HIDE series perfectly shape each facade thanks to the hidden box, which is mounted in the wall, do not cover the window, and remains invisible in open position. 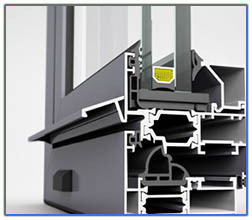 Their disadvantage is that they can’t be installed on existing windows because they are placed in assembly with the windows frames. 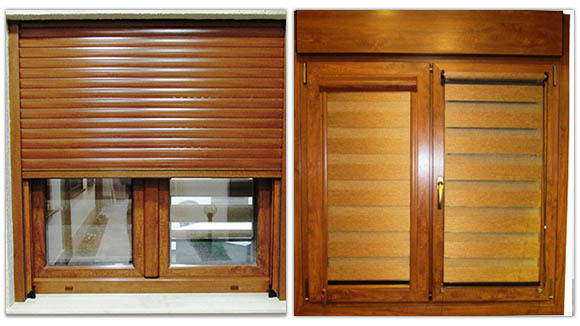 The external roller shutters of MILKANA VISION series are innovation in this type of shutters. In addition to the functions typical of traditional external roller shutters, they also have the opportunity to move and adjust the lamellae. This allows controlled transmission of light and air. The lamellae can be rotated with an angle up to 27°..
With the variety of colors they are closely involved in shaping the exterior. 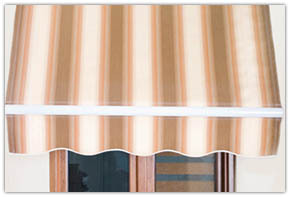 They are one of the most elegant and effective sunscreening products. They can be very well adapted to the weather conditions so as to prevent the passage of more than 90% of solar energy. Thus, the operation of the cooling systems can be reduced significantly. In fully closed position they limit visibility and penetration of light; you can move them up and down or just rotate the lamellae to adjust the transmitting. They are highly functional in their automated version, especially if you add sensors for sun and wind. In the option without automation, the control is carried out manually, by means of a crank, which is mounted on the inner side of the window. The yare made of aluminum with a powder polymer coating, resistant to adverse weather conditions. The shade is an article for sunscreening. It provides comfort and at the same time protects against burns. Depending on the type and size of the site to which the shade must be fitted, the model structure is determined. It is a means of beautiful and effective protection from sun, wind and rain. Prevents direct contact with the rays. Filters the sun ray by stopping the harmful UV rays. Reduces the ambient temperature by more than 7?C. Does not stop the natural light flow. Prevents fading of the goods in shop windows and the furniture in your garden or balcony. Almost all models have the option to be electrically driven and sensor for wind or wind/sun for a higher level of protection. Made on an individual customer’s size. 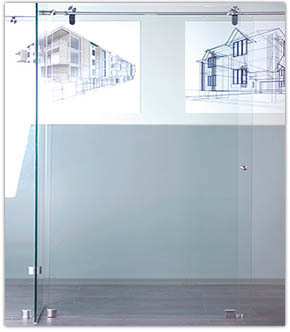 MILKANA Ltd offers wholesale and retail trade of glass. We work with high quality glass of established manufacturers, some of which are: Saint-Gobain; AGC; Pilkington; Trakya Glass and others. 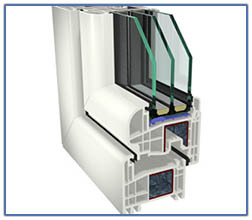 MILKANA Ltd. manufactures a wide range of glazing. We have production workshop with advanced equipment, working with leading manufacturers of glass (Saint Gobain, AGC, Pilkington, Trakya Glass) and consumables (Den Braven, Kommerling) to offer the highest quality glazing. To meet all requirements, we tested our products in the ndependent Italian laboratory “Stazione Sperimentale del Vetro”. The good test results give us the right to place the CE marking (mark of conformity to harmonized European standards) on our glazing. MILKANA BATH shower cabins and bath screens are made of 8 mm tempered glass. 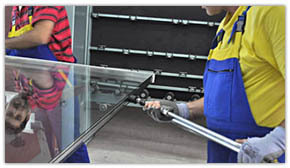 The tempered glass is a type of safety glass, which increases its hardness and strength by controlled thermal or chemical treatment, and if it breaks, it breaks into small not sharp pieces, so it can not hurt you. The glass can be transparent, frosted, colored (brown, green, gray) or with decorations of your choice. The decorations are implemented with thermal and waterproof foil and can also be in various colors. We use high quality hardware of OZONE brand. Each screen is designed individually according to the customer’s requirements. It’s up to you if you want tube sliding, rail sliding, folding, shower with magnetic closures or just a screen. MILKANA BATH shower cabins and bath screens could be made of glasses Showerguard. ShowerGuard glass stops corrosion before it starts. ShowerGuard glass is backed by a Lifetime Consumer Limited Warranty. Standard shower glass care requires a lot of effort to keep clean. Staying on top of soap and mineral build-up could be a daily chore. 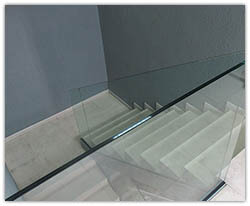 The glass railings produced by MILKANA are a real temptation for designers and architects. Stylish and sophisticated, without visible profiles, they reveal panoramic views and give air to any room. Suitable for both interior and exterior applications. Resistant to extreme weather conditions, including coastal areas. Extremely strong and stable thanks to the reinforced supporting profile along the entire length and 16mm or 20mm laminated glass. They can be mounted on the floor and on side. Available with and without rail. 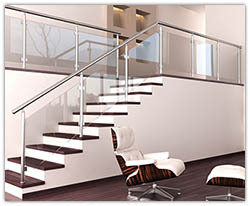 The aluminum railings made by MILKANA can be used in office and public buildings as well as in private homes. 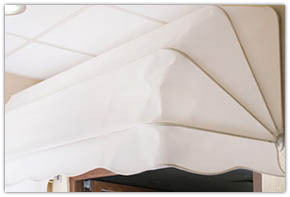 Suitable for interior and exterior stairs, balconies and terraces. Sleek and stylish design with horizontal strings or glass. They can be made in various versions, according to the specific project and your design vision. Two or more horizontal strings or laminated glass. The rail can be with powder coating in RAL color or woodgrain. The glass is also a matter of choice - white, colored, frosted or decorated with special thermal and moisture resistant foil. Dear customers and visitors of BUSINESS.bg, please send mesages in the form of e-mails to company Milkana only in connection with the services or products offered by Milkana. If you send advertising or other communications provided by you or any third party goods or services to Milkana will be considered unsolicited commercial messages. Sending such messages is prohibited by law and constitutes a violation of Bulgarian law and the Terms of BUSINESS.bg.